Size of Male: 42-60 lbs., 20-23 in. Size of Female: 35-50 lbs., 17-21 in. The Portuguese Water Dog’s name suggests an affinity for water. After all, when you don’t find the breed frolicking at home, you’re sure to spot them enjoying a cool splash outdoors. Bearing some physical resemblance to poodles, the Portie, as they are known, loves to be in the thick of action, quick to draw attention with barks and yaps. The breed sports two coat varieties: curly and long-haired. In Portuguese tongue, this dog breed goes by the name “cao de agua” which literally means “dog of water.” The pooches descended from Asian herding dogs which Visigoths, Berbers or Moors later introduced to Portugal between the 5th and 8th century. The breed was quick to distinguish its usefulness in various fields such as fish herding, diving, trawling and recovering lost nets. The demise of traditional fishing methods marked the decline of the breed towards the 20th century. Due to the efforts of one business tycoon, however, the Portie remains alive, well and prolific today. Though not to be trusted around smaller animals, the Portie is a lovable and sweet-natured companion to its master and strangers alike. It will gladly stay beside you whether you’re at home or out on a beach vacation. You can even liken the pooch to your shadow (except for the nipping part). It loves to tail you and follow your bidding. 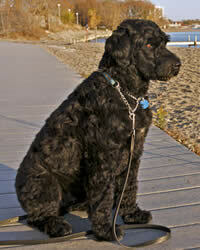 Living Environment – Unlike other breeds, the Portuguese Water Dog is tolerant to both hot and cold weather. Its ideal living environment is an organized space with you present most of the time. The Portie has a fond habit of mouthing things. An ample yard space is recommended as well because these dogs can resort to destructive behavior without adequate physical and mental stimulation. You may want to consider raising a calmer, less active dog breed if your household consists of the elderly and the young. Grooming – To keep the Portie’s coat tangle-free, you must brush the dog daily or at least once in every 2 days. The monthly trimming or clipping will also depend on the “look” you desire for your pet. There’s the retriever cut or the lion cut to choose from. You should also check for burrs after the dog has had some off-leash play in the yard. Diet & Exercise – These dogs are accustomed to fish, but you can substitute this with meat or poultry. A raw diet appears to be the norm for this dog breed. Most pet owners recommend a home-cooked meal, however. The breed’s exercise needs can be quite a handful for the sedentary pet owner. They require physical activities on a daily basis. It relishes a good swim or an action-packed outdoor excursion with you, though brisk walking and vigorous yard games will do just fine. Health – The Portuguese Water Dog is booned with a long life span, but experts still associate the breed with a few serious health risks. Glycogen storage and chronic heart diseases are the top concerns. Hip and eye exams are strongly suggested for this breed. Intelligence and eagerness to learn makes dog training possible for the Portie. However, its hyperactive nature may sometimes manifest as stubborn behavior during the training. You’ve got to possess the right combination of technique and character to command this breed. Portuguese Water Dogs are not only good in the water. They also stand out in agility and obedience routines.